In a recent hexagon post, I received a few questions regarding hexagons and the way I planned to finish my hexagon quilt. 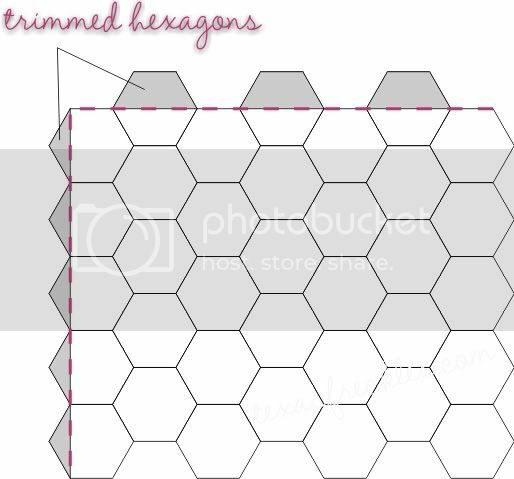 Since the hexagon charm quilt is going to be a fairly long process, I'd like to post at least once a week with some hexagon tips, thoughts, trivia, or inspiration to keep us motivated. I will answer all the questions over the next few weeks. This week, I've been thinking that it's not too soon to think about the quilt binding. Grandmother's flower garden quilts can be finished in a number of ways, but I'm planning to straighten the edges of my hexagon quilt. This means that some of my hexagons will be trimmed and some will actually need to be cut in half. Why think about this now? 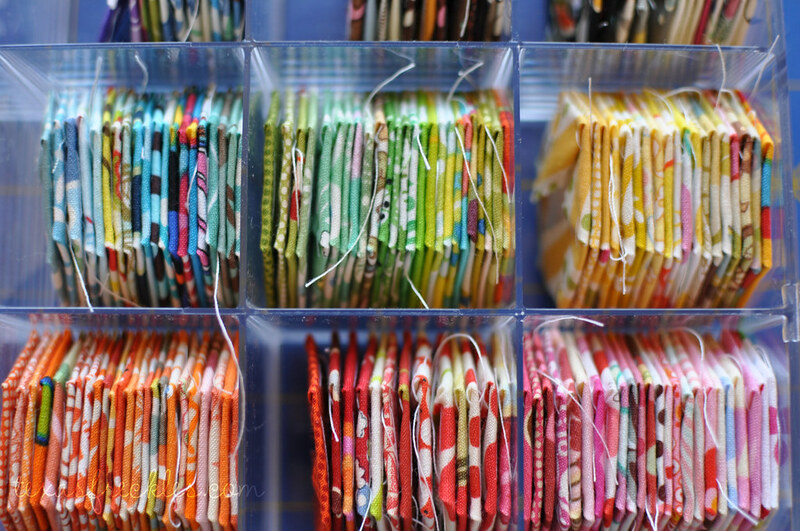 Because if you are working on a charm quilt, you'll probably want to avoid using your favorite prints in one of those positions that will be trimmed in half. After binding, those little hexagons will be almost hidden on my quilt. If I decide to sew my hexagons together as I go, I'll want to place my least favorite prints in those positions. I'm still undecided about the layout for my charm quilt. Part of me just wants to continue what I started with the totally random and scrappy layout, but part of me thinks I would be happier in the end with a color spectrum layout. There's also the little voice I'm trying to ignore that says just do the random layout this time and do the color spectrum layout next time. Next time!?! I asked my daughter what she thought and I didn't really like her no-nonsense answer. It went something like, "Keep making hexagons, but don't sew them together yet. Then, when you finish the first quilt you started hand quilting [referring to the Color Wheel Quilt], you can sew the hexagons together in a rainbow." She just had to go there. Ouch. You're not alone, Mel! I'm sitting with a stack of merely 50 2" hexes before me and wondering the very same thing. Spectrum? Random? Spectrum blocks sashed? Random blocks sashed? I have about 300 to go before I "need" to make the decision, but we can't think about it too soon, right? Don't you love kids! I started mine with freezer paper 1" papers, works great, and that sampler box of Moda's newest lines (I got the box last fall with no real plans to use it.) It is working out great. I think mine will be random with some solid borders maybe..I'll have to think about that some more. Thanks for gettin me started. 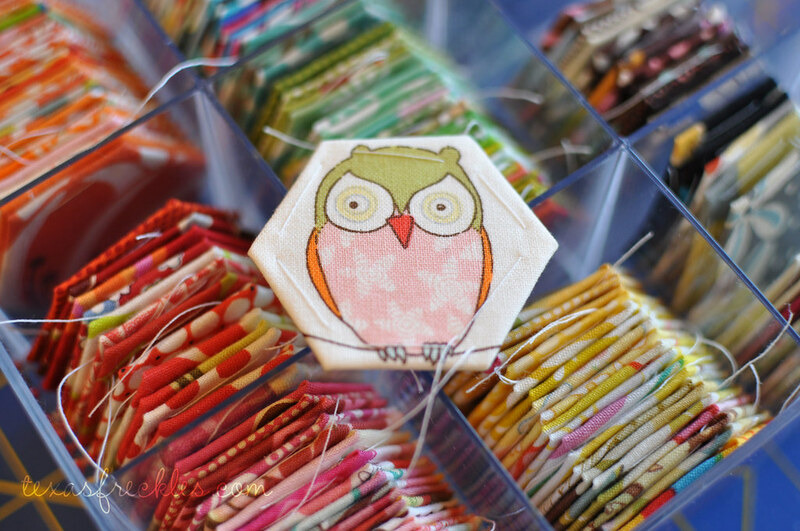 Okay....that owl is so cute, I never would of thought of using that print in a hex. That is one of the many reasons I love blog land, it expands your view. Although I think the color spectrum would be pretty, I have to admit that there is something about random quilts that warms my heart. It is always amazing to see how beauty falls together when it isn't planned. As someone else doing 1" hexes, I'm definitely voting for the colour spectrum or some other kind of vague ordering (light to dark? That could be fun! ), as I sometimes find that with little pieces the overall look can be a little muddy if there's no order whatsoever. Know what I mean? Maybe you could set yourself a 300 hex challenge (or something) and practise with some layouts when you're that far along. Great tip! I love that owl fabric so very much, too. I can totally relate to the feeling of having oh-so-many projects in the works. I get giddy with the beginning of a project and then, in my excitement, I forget that I have 650 other projects that I'm also trying to finish. *sigh* such is life. Love that diagram for your hexie layout! And I love how lovely all your hexies look sitting upright in their storage bin. I am very inspired watching this fun project (and all your hard work) come together! I'm new to your blog and am finding it so fun to visit your virtual home. your quilting is amazing! your talent and skill we can all learn from. thanks for sharing so much with us! Ooh those hexagons are so pretty arranged like that. When you've decided what to do with yours, maybe I'll be able to decide what to do with mine - also made with the moda sampler box and a Verna jelly roll - soooo pretty! hi, i've just picked up a 1970s patchwork book and the author recomends cutting the PAPER in half to make half hexies, so you only make halfs for the edges and dont loose 1/2 a made one. inspired! I know this is an older post, but I had to say hi! I've been stalking hexagons through your blog since last year and finally started up a couple weeks ago. It's a dangerous obsession! Thanks for your awesome tips, tricks and video tutorials. I love them all!